Check out new evidence by an international team of scientists — including CWRU astronomer Chris Mihos — showing that galaxies continue to grow by eating their smaller companions. The huge halo around giant elliptical galaxy Messier 87 appears on this very deep image. An excess of light in the top-right part of this halo, and the motion of planetary nebulae in the galaxy, are the last remaining signs of a medium-sized galaxy that recently collided with Messier 87. 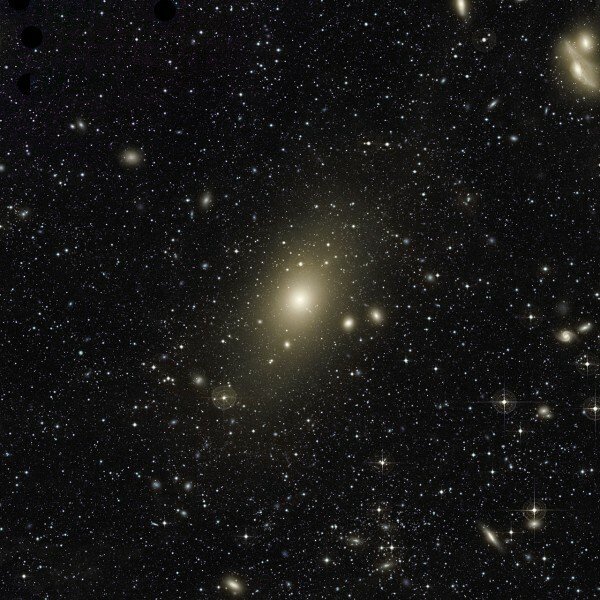 The image also reveals many other galaxies forming the Virgo Cluster, of which Messier 87 is the largest member. In particular, the two galaxies at the top right of the frame are nicknamed “the Eyes”. Read more about this research in the news release on the website of the European Southern Observatory, or download the full journal article to see all the details..